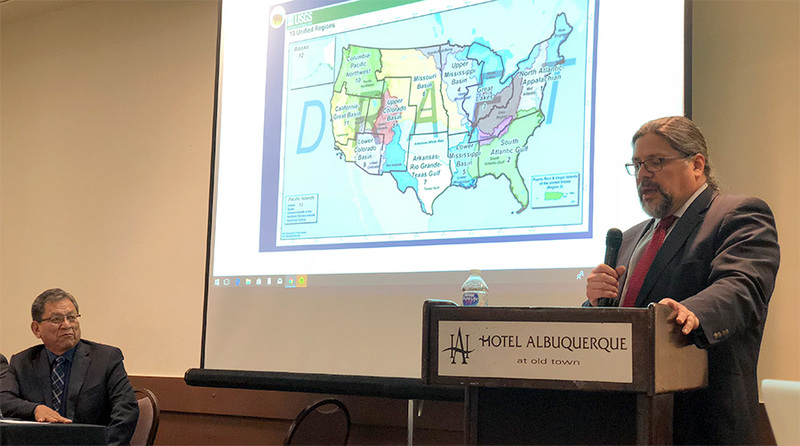 Albuquerque, New Mexico- Several tribes belonging to the Coalition of Large Tribes (COLT) met in Albuquerque, NM on April 26, 2018 on major issues facing large land-based tribes including treaty obligations, transportation, health care, environmental concerns, etc. 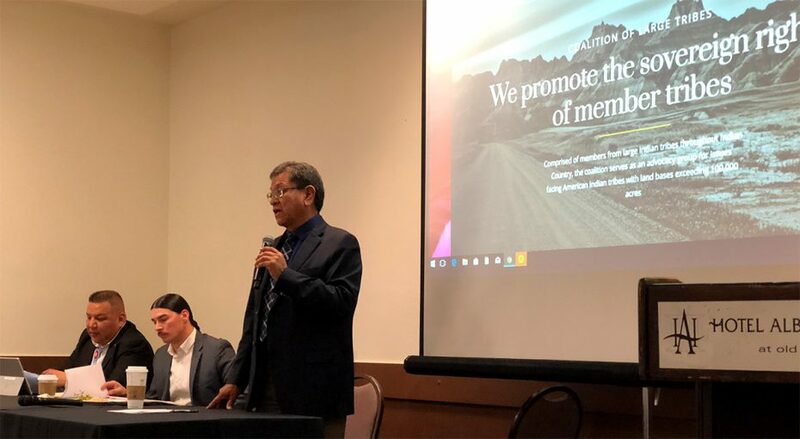 COLT meets quarterly to advocate for legislative, regulatory and policy reforms to improve unique issues affecting large land base tribes. Update from the U.S. Government Accountability Office presented by Jay Spaan (Cherokee Nation of Oklahoma), Senior Analyst. 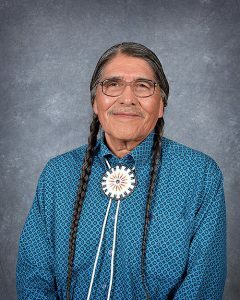 COLT has an elected Board of Directors that serve for two-year terms, they are: Chairman Russell Begaye (President of Navajo Nation), Vice Chairman Harold Frazier (Chairman of the Cheyenne River Sioux Tribe), Secretary David Browneagle (Vice Chairman of the Spokane Tribe), and Treasurer Nathan Small (Chairman of the Shoshone-Bannock Tribe & COLT founding member). 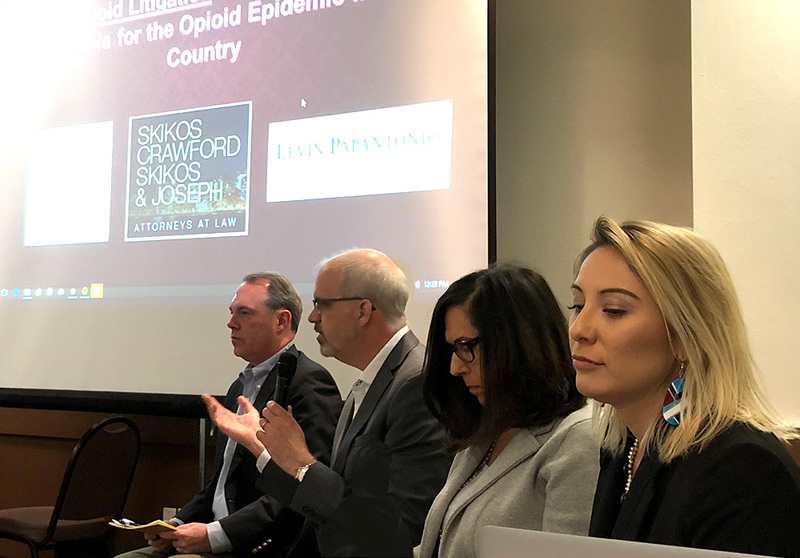 In the past ten years, COLT has grown to include a COLT Executive Director, Melissa Holds the Enemy (Crow) and COLT Executive Legislative Director OJ Seamans (Rosebud Sioux Tribe). COLT website update and approval of one year web development contract provided by Mike Stone, Sunflicker LLC of Fort Hall, Idaho. Authorized a letter supporting treaties to Secretary, Zinke, Principal Deputy Assistant Secretary Tahsuda, and Solicitor General Francisco, in the Herrera v. Wyoming, No. 17-532, case that is currently pending at the United States Supreme Court. Resolution supporting the Oglala Lakota Nation Education Coalition’s position and requesting increased funding fund and a congressional field hearing on all Tribal Treaty Schools. Resolution endorsing Dr. Gavin Clarkson (R) and Deb Haaland (D) both Tribal members and are candidates for two separate New Mexico Congressional house seats. Resolution requesting 2% of the total amount of rural infrastructure budget be set aside for road maintenance and water projects for use on Indian Lands. Reauthorized its support of Tribal Full Participation in the Small Business Administration’s 8(a) Business Development Program previously passed by resolution. Resolution in support of changing Sub-Chapter S corporation legislation. Resolution supporting the Rosebud Sioux Tribes request for an investigation into Tribal Emergency Medicine that is currently under contract with Indian Health Services. Resolution requesting the amendment of the 2017 tax legislation for a direct allocation to Tribal lands for the opportunity zones and request Congress enact said amendment. Resolution to amend the Radiation Exposure Compensation Act., that expires on July 10th, 2022 and to improve the compensation for workers. Overall, COLT is continually working with Congress, State and Federal agencies on issues that affect large Tribes. COLT Tribes govern its own Judicial programs that include Court and Law Enforcement, Social programs, Treatment programs, Housing programs, Transportation/roads which includes, bridges, and public buildings, thousands of miles of roads, education, workforce development and schools. COLT was formally established in early April 2011, and is comprised of Tribes that own over 100,000 acres of land base, current member tribes include the Mandan, Hidatsa and Arikara Nations, the Oglala Sioux Tribe, the Navajo Nation, the Sisseton Wahpeton Sioux Tribe, the Blackfeet Tribe of Montana, the Rosebud Sioux Tribe, Northern Ute Tribe, Shoshone-Bannock Tribe, Eastern Shoshone Tribe from Wyoming, Fort Belknap Tribe and Cheyenne River Sioux Tribe.